Our Narcissus bulbicodium citrinus are are pot grown because the bulbs must not dry out. The bulbs are 3 years old and most will flower in the first season after planting and will flower year after year thereafter. If they are planted in the right situation the bulbs will increase the longer they are in the ground and they will self seed too. * There are 3 well-rooted bulbs on average per pot. 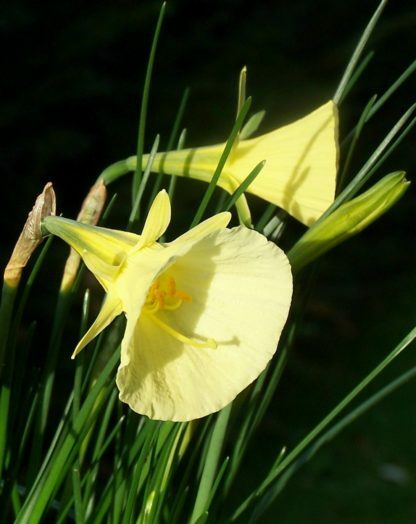 Narcissus bulbocodium subsp. bulbocodium var. 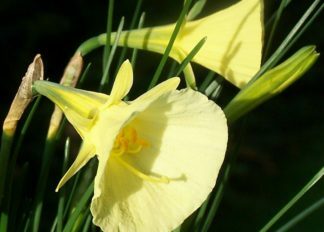 citrinus is a dwarf, bulbous perennial, to 15cm tall, with narrow, bright green leaves and pale yellow, outward-facing flowers in mid-spring comprising a conical, flared trumpet and very short, narrow, pointed petals. Your company responded extremely promptly to my order. The plants arrived yesterday – I was impressed by the excellent packaging, to protect the plants the hessian to prevent spillage and the good labels, the excellent paperwork/instructions and lastly – perhaps most importantly the excellent condition of the plants themselves. They are now safely planted out and I look forward to seeing them flower. My thanks to you and your team for your excellent service. Long may you prosper!